The girl in the front row seemed remarkably plucky and cogent for someone who claimed to be in such dire straits. “This whole melodic vs. harmonic thing hurt my brain. I think I might have had an aneurysm,” she said. “Good!” came Heather Woodbridge’s chirpy reply. “We need some homework CPR.” Woodbridge’s music theory class was working on building and naming chord inversions, a rather dry and difficult task made, if not quite fun, at least far easier and more accessible by the iPad. “It definitely helps,” Woodbridge said. “Especially in this class since the music theory textbook is also the music theory workbook, so to grade homework, I had to collect everyone’s book and carry six textbooks home that the students didn’t have to learn from. Her students also combined analog and digital in clever ways. For example, Woodbridge displayed the answer key on the projection screen, prompting one student to — in one seamless act — snap a photo of the answers, rotate and resize the picture on his screen and proceed to check his work against the key, keeping his attention on Woodbridge and his work rather than laboriously going back and forth from projection to page for each question. Outside the classroom, Elissa Quinn has found a way for the iPad to enrich her Civ 1 students’ experience on their annual field trip to the Philadelphia Museum of Art. By digitizing the material she had committed to handouts in years past, the result for her and students was “less paper, that was less clunky with less schlepping,” Quinn said. “Whatever they look at [at the museum], we want them to really look at” without the hassle and distraction of filling out worksheets or finding classmates amenable to loaning their backs out as desks for the task. As so often proves the case with the iPad, the students quickly find their own ingenious uses for the devices that go beyond where their teachers have led. For example, Quinn saw that, “Students took the initiative to photograph artwork and then type notes on the pictures,” with the notes reflecting both Quinn’s lecture as well as the students’ own thoughts and reflections on the pieces they were annotating and absorbing. In Juliette Winterer’s biology class, not only have kids’ backpacks gotten lighter by a matter of several pounds, but their e-textbook allows them to watch videos, explore animations and even helps them study: Everything a student highlights gets compiled into an outline as well as digital notecards that contain not just the highlighted material, but the students’ own notes as well as all of that chapter’s glossary terms. “It is pretty amazing,” said Winterer, who proceeded to demonstrate something even more amazing. 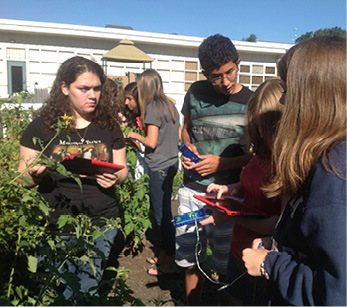 In September, she and her class headed outside armed with their iPads, their curiosity and some nifty multifunction probes and measuring devices the school bought with the proceeds from last year’s Children’s Challenge. The sensors can measure everything from temperature to light intensity to CO2 concentration, and they transfer their findings to the iPad. Winterer gave the students a deceptively simple assignment: Go ask a question that you can answer with these probes. “It was literally that broad,” she said. “The goal was to figure out how to ask the question you’re trying to ask, like what’s the difference in the amount of light that’s reflected off a red tomato vs. a green tomato that makes one green and one red? Then forming a hypothesis and testing it right there, on the spot.